We have prepared the most comprehensive edition of the work of our only Nobel Prize for Literature Iva Andrić in Czech: The Bridge on the Drina; Chronicles of Travnik; Jelena, the Woman of My Dream; The Vizier's Elephant; The House on Its Own. Omer-Pasha Latas; Signs by the Roadside. His works have been translated into many languages and can be found in almost all libraries in the world. He is one of the few Nobel laureates who have donated the money from the Nobel Prize. He has contributed Bosnia and Herzegovina to the development of librarianship. 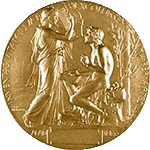 Nobel Prize for Literature won in 1961 in Stockholm, Sweden, for the roman The Bridge on the Drina. 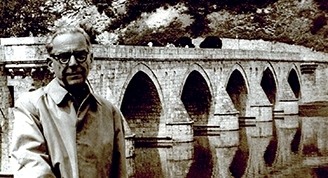 Ivo Andrić is currently the only Yugoslav Nobel Prize winner for literature and is still the most translated Yugoslav author. 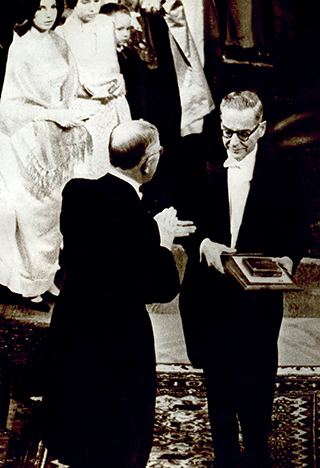 For the epic force with which he has traced themes and depicted human destinies drawn from the history of his country, Ivo Andrić received Nobel Prize for Literature in 1961. He expressed his gratitude in the speech „O priči i pričanju“ (“About story and telling”) for the recognition that he was allocated, 10 December 1961. Although by then his works was translated into many languages, but after the award began a great interest in work of this Balkans writer. His novels and short stories were printed in over thirty languages. The full amount of the Nobel Prize he donated in two parts to libraries Fund of Bosnia and Herzegovina. In addition, he participates in activities for help libraries and gives money to charity. 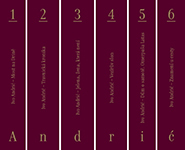 In 1963, Publishers' Association (composed of publishers: Prosveta, Mladost, Svjetlost, state of Slovenia) issued the first Collected Works of Ivo Andric in ten volumes. Next year stay in Poland in Krakow, where he was promoted to honorary doctor Jagiellonian University. He didn’t write much anymore, but his books constantly reprinting in the country and abroad. "It seems to me that if people knew how very difficult living was for me, they would more easily forgive me all the evil things that I did and all the good things that I missed to do and they might even feel sorry for me." "And then the death will come. The great parting, but the least painful of all the goodbyes we ever knew. For in death, only one shall grieve. And so far we have always, at every parting, grieved together." "Being afraid of people means doing wrong to God. The fear of people might have its source in our former sin to God’s principle. A man with a living soul logically shouldn’t be afraid of people or anything human."